Hundreds of immigrants rally at Capitol demanding right to a drivers license | Fight Back! Saint Paul, MN - More than three hundred Latino immigrants and supporters rallied in the Capitol rotunda and marched to Governor Dayton’s office March 26 to press Governor Dayton and House Speaker Paul Thissen to pass HF348, the bill for drivers licenses for all. The rally was organized by Mesa Latina and supported broadly by the immigrant rights movement. Currently undocumented immigrants cannot get drivers licenses in Minnesota, though they can in several other states. Due to extreme weather and inadequate public transportation, the thousands of immigrants that live in Minnesota are forced to drive for everyday tasks, like getting to work and taking children to school. Many of the immigrants that are deported and separated from their families first get ensnared in the criminal justice system when they are stopped for driving without a license. Once in the criminal justice system, Immigration and Customs Enforcement (ICE) intervenes and starts deportation proceedings against many people who have done nothing more than drive to work. The Minnesota Senate passed the bill last legislative session, so only the House needs to pass it and the governor would need to sign it. Governor Dayton’s lack of support has stalled the bill. 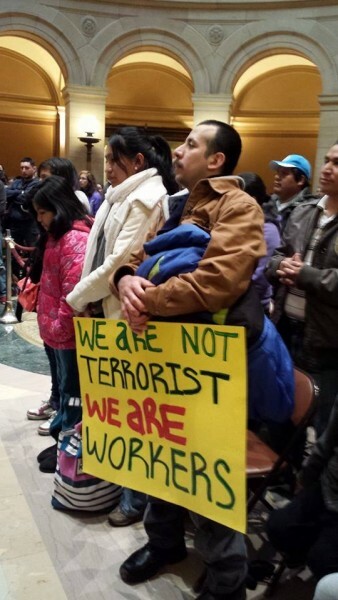 Governor Dayton is a Democrat and the House is under Democratic control, but so far they are still refusing to move on this bill even though it is the highest priority at the State Capitol for the immigrant rights movement this year. During her speech Rep. Karen Clark, the House sponsor of the drivers license bill, encouraged everyone to go to Governor Dayton’s office inside the Capitol to let him know he should support drivers licenses for immigrants. 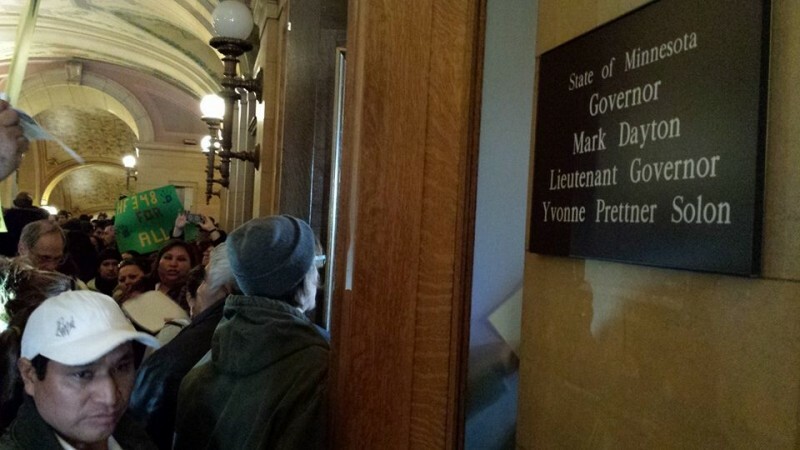 So when the speakers were done the crowd marched through the Capitol, pouring inside Dayton’s office and filling the hallway outside while chanting “si se puede!” and “Ole ole ole ole, drivers license!”. They then marched through the first and second floor of the Capitol. Mesa Latina is encouraging people to sign the online petition to support the Drivers License bill, HF348. 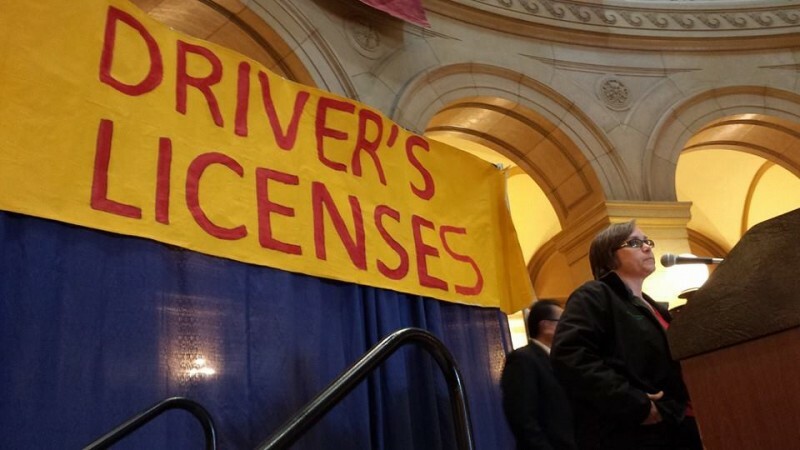 For more information on the drivers license campaign and the May 1 mobilization on International Workers Day follow MN Licencias Para Todos on facebook.